Among one of the masters in the art of comedy, Jacques Tati was someone who could effortlessly blend humor with social commentary like no other. He took the pantomime style of Charles Chaplin and infused it with a whimsical persona that was infectious. Though he only made six feature films, and a handful shorts, in his career, Tati managed to bring something new to the world of comedy in the post-war cinema era. Regardless of whether his tales focused on the simplicity of small town life or the craziness of the big city, he consistently entertained audiences by mixing humor, an air of sentimentality, and bits of drama into his films. Within a world succumbing to the pressures of modernism, his films evoked a nostalgic look back at simpler time when life was more than obsession over gadgets. Born Jacques Tatischeff on October 9, 1907 in Les Pecq, France, Tati was the youngest child of George Emmanuel Tatischeff and Marcelle Claire van Hoof. Since George Tatischeff was the son of a General in the Russian Imperial Army, and a military attaché for the Russian Embassy in Paris, he was able to maintain a high lifestyle for his family. For the young Tati, the carefree lifestyle allowed him to take part in different sports including being part of semi-professional rugby team in Paris in his early 20’s. However, it was not until he met Jacques Broido, one of his early collaborators, that Jacques Tati discovered his gift for comedy. When the Great Depression reached France in the 1930s, Tati left the family business and embarked on a journey to learn the performance art of pantomime. With the aid of his former coach Alfred Sauvy, Tati got the chance to perform on stage and saw first-hand the joy his work brought to people. He took pleasure in the fact that his art gave others a momentary escape from the harsh realities of the Depression. In 1932, Jacques Tati decided to give cinema a try and wrote his first script entitled Oscar, champion de tennis. The script ended up being turned into a short film directed by Jack Forrester. Early in his career Tati wrote and starred in several short films. The first short, entitled Brute Wanted, revolved around a young man who answers a job posting unaware that the position is for a professional wrestler. The short highlighted Tati’s gift for physical comedy, especially his in regards to his wonderful sense of comedic timing. The next project Tati took part in was a short called Fun Sunday, which he starred alongside Enrico Sprocani, who was more famously known for his work as the clown Rhum, about a couple of conmen trying to swindle some people by taking them on a tour of the French countryside. Directed by Jacques Berr, the short found Tati playing the straight man to Sprocani’s dominant persona. Tati’s work in the film opened even more doors for the talented performer than his previous short did. In 1936, aided by friend Jacques Broido, Tati once again wrote and starred another short, called Keep Your Left Up, about a wannabe boxer who gets a chance to live his dreams by stepping into the ring. However, he quickly realizes that one needs to be careful of what you wish for. Helmed by René Clément, a filmmaker who eventually became a prominent figure in French cinema, the short not only showcased Tati’s comedic sensibilities but also garnered some attention outside of France. After serving a stint as a soldier during World War II, Jacques Tati returned to civilian life following France’s surrender to Germany in 1940. While working as a cabaret performer at the Lido de Paris, Tati met and fell for the Czech/Austrian performer Herta Schiel. The pair had a daughter, Helga Marie-Jeanne Schiel, in 1942 but Tati refused to acknowledge the child was his, a denial that he ultimately regretted uttering years later. It was around this time that Tati that gave serious thought to the possibility of directing his own works. Following the end of the war, which saw him marry Micheline Winter in 1944, Tati met film producer Fred Orain and decided to form a production company together. This gave Tati the chance to make his first solo short film L’École des facteurs. L’École des facteurs revolved around a young postman-in-training getting the chance to work on his first route. The short featured several gags that recalled elements of Buster Keaton and Charles Chaplin, while still remaining true to Tati’s distinct onscreen persona. The film was well-received upon its release in 1946, and capped off a year which also saw the birth of his second daughter, Sophie Catherine Tatischeff. Pleased by the success of the short, Tati decided to expand the story in to his first feature-length film. Further exploring the themes of L’Ecole des facteurs on a larger scale, Jour de Fête is a work that set the course for the brand of films that Tati would make for years to come. 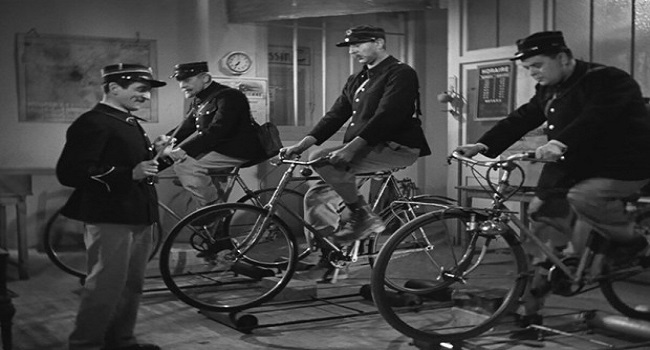 Teaming up with Henri Marquet and René Wheeler to write the script, the story took place in a small French town, on Bastille Day, as Tati’s bumbling postman character unknowingly caused a slew of trouble over the course of a day. With a crew that included cinematographers Jacques Mercanton and Jacques Sauvageot, and a cast that featured performance by Guy Decomble, Paul Frankeur, Santa Relli, and Maine Vallee, Tati created a film that felt natural in its approach to comedy. Though largely shot in black-and-white, Tati experimented with the Thomson-color film stock while making the film. This resulted in Tati putting in bits of color in some of the frames during post-production. While the final product was rather messy, the film showcased Tati’s desire to bring something new to the world of cinematic comedy. He even threw in some pointed commentary about the pressure on France to incorporate more American style ideals. Jour de Fête made its premiere in the spring of 1949 in London before getting a French release a few months later. The film was well-received and ended up being a big hit in France. Celebrating both the film’s success and the birth of his son, Pierre Tatischeff, Tati decided to take time off before jumping into his next project. Jacques Tati’s next film Monsieur Hulot’s Holiday, was set in a tiny seaside vacation town in Loire Atlantique region of France. It was in the writing process where Tati came up with Monsieur Hulot, a character who became one of cinema’s most iconic figures. 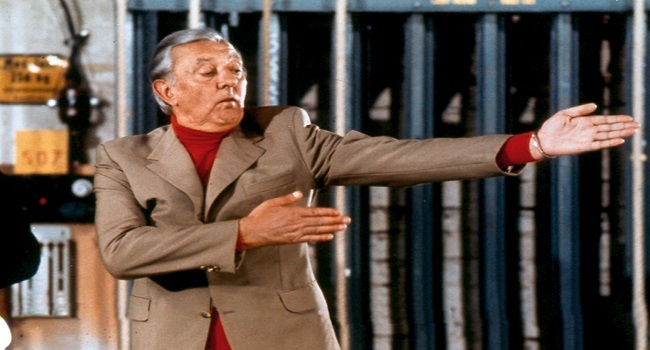 Highlighting Tati’s own personal disdain towards the modern world in a comical fashion, Hulot was the embodiment of a much simpler time in life. Everything from the character’s trademark look, including the umbrella he carries, the trench coat and hat he wears, and the pipe he smokes, screams of an era that was no longer in fashion. The film told the story of Hulot’s vacation at a resort and the ways in which he, completely unaware of the fact, makes an impression upon nearly everyone he encounters. Much of the hilarity stemmed from Hulot’s ability to inject himself in various situations involving those whom felt overwhelmed, neglected, or just not in tune with what is happening at the resort. 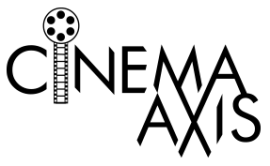 One of the unique aspects of the film was the limited amount of dialogue. Hulot doesn’t say much verbally but express himself physically; which adds a wonderfully offbeat charm to the film. Monsieur Hulot’s Holiday made its premiere in February of 1953 in France and was major smash critically and commercially. A few months later the film screened at the Cannes Film Festival before getting an international release. The film even received an English-Language release in America in 1955. The American release gave Jacques Tati and co-writer Henri Marquet their first Oscar nomination for Best Original Screenplay. After he endured an injury from an auto accident, and had a falling out with producer Fred Orain, that resulted in Tati forming a new production company, the director decided to make another film in his informal Monsieur Hulot trilogy. 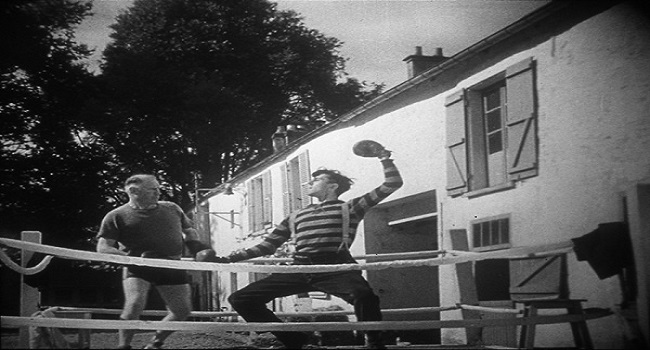 Co-written with Jacques Lagrange and Jean L’Hote, Mon Oncle explored Monsieur Hulot’s various escapades with his nephew. Enjoying the simple pleasures of life, Hulot frequently becomes baffled by both modern architecture and post-war France’s obsession with materialism. While retaining comedic elements from his previous film, Mon Oncle approached its subject matter with a much more somber tone. Tati decided to shoot the film in color and retained the services of Jean Bourgoin and Henri Schmitt to handle the cinematography and art direction respectively. Schmitt’s set design, which included a house that resembled a face, was a key component of the film. It added an air of silliness to the film that nicely played up Hulot’s confusion with the world. Tati injected humor into elements of everyday life to highlight humanity’s absurd reliance on items that they don’t really need. Mon Oncle premiered in France in May of 1958 at the Cannes Film Festival to a massive ovation from audiences and critics. 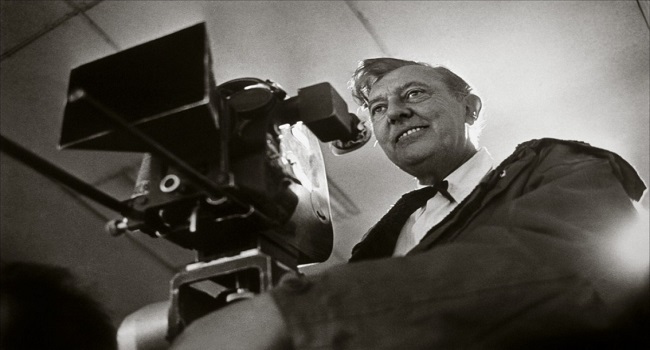 The astronomical success of the film culminated with Jacques Tati winning an Oscar for Best Foreign-Language Film. While he attended the ceremony, Tati used the trip to Los Angeles as an excuse to meet silent film legends Stan Laurel, Mack Sennett, and Buster Keaton in their respective nursing homes. Though his Monsieur Hulot character resulted in back-to-back international success, audiences had to wait nearly a decade for the character to return to the big screen. Although Tati tried his best to come up with film ideas that did not involve his beloved Monsieur Hulot, the constantly changing nature of the world sparked an idea in the director that only the Hulot could articulate on the big screen. 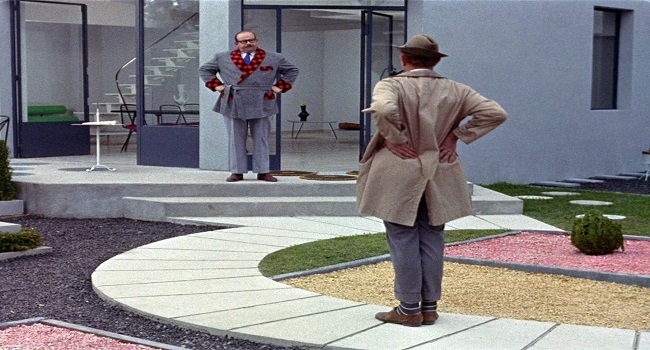 Teaming up with Jean Lagrange and famed newspaper humorist Art Buchwald, who provided some of the English dialogue, Playtime told the story of two individuals, Monsieur Hulot (Jacques Tati) and Barbara (Barbara Dennek), who repeatedly encounter each other over the course of a day. Aided by production designer Eugene Romand, sound mixer Jacques Maumont, and cinematographers Jean Badal and Andreas Winding, it took years for Tati’s vision for the film to be realized. Tati had several extravagant ideas, including his instance to shoot on 70mm, which made the film Tati’s most ambitious work to date. The film showcased a futuristic world where ultra-modernism was a plague that led to the lost of identity. By time the 155 minute original cut of Playtime was finished, the budget had swelled to an astonishing $17 million. The film was cut down to a manageable 124 minutes in time for its December 1967 release. While the film was well-received by critics, Playtime was a commercial failure. Part of this was due to the fact that most theatres were not equipped to handle the film’s 70mm format. The film eventually got a shortened 103-minute 35mm cut for its U.S. release. 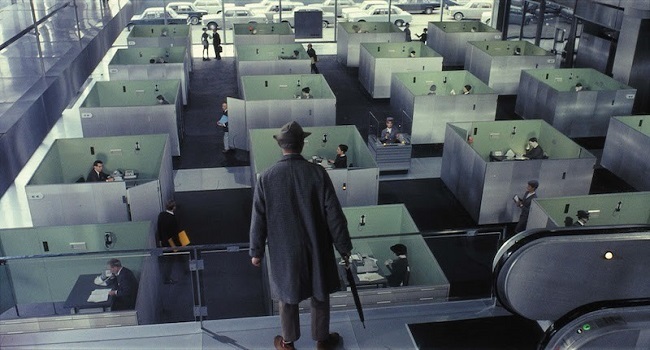 Despite its poor commercial reception, many critics hail Playtime as Jacques Tati’s greatest triumph. Following the financial loss he took on Playtime, which led him to file for bankruptcy, Jacques Tati took some time away from the world of cinema to clear his head. In a need to get back on track, Tati decided to create a small film, Trafic, with Jacques Lagrange and Bert Haanstra, which was set within the automobile industry. The narrative involved a designer who to travels to Amsterdam to premiere his company’s new car. The film ended up being the third and final piece of Tati’s informal trilogy on the fallacy of modernism. Shot in France and Amsterdam, Tati once again played the role of Monsieur Hulot, for the final time, and surrounded himself with a much smaller cast. Maintaining control of all the physical beats in the film, Tati utilized intricate choreography to emphasize both the absurd nature of car shows and the ways in which automobile companies try to sell themselves to the public. These moments where highlighted further by the sharp editing that was handled by Tati’s own daughter Sophie. Tati reveled in having Sophie on the project as he often felt that, due to work, he hadn’t spent enough time with his children. Though Tati originally wanted the film to be released on television, Trafic ended up having its theatrical premiere in April of 1971. 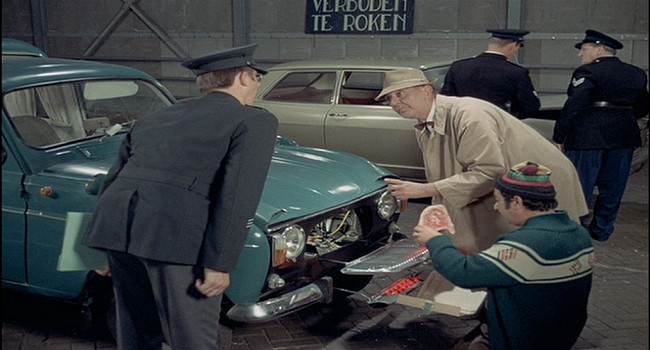 Despite being a critical and commercial hit, the film marked the end of an era for Jacques Tati. Trafic was the last narrative-based feature film he made as Tati turned his attention to other aspects of entertainment in his remaining years. A couple of years after Trafic, Tati was asked by Swedish television to do a film that they could eventually televise as a special. Parade captured the magic of the circus with Tati serving as both ringmaster and a clown. It was filled with wonderful little moments where Tati and his performers win over audiences of all ages. While he let the other circus performers have their moment to shine, and be part of the stage crew, Tati also used the film to display his mastery in the art of mime. In order to capture the intimate feel of the circus, Tati decided to shoot the film on both 35mm and 16mm. Parade premiered in May of 1974 at the Cannes Film Festival where it played out of competition. After the release of Parade, Tati went into semi-retirement despite toying with a few potential film ideas. In 1977, Tati received an honorary Cesar for his body of work. What made the award extra special was the fact that his daughter Sophie won a Cesar that same night for her short film entitled House Specialty. A year later, Tati was asked by SC Bastia president Gilberto Trigano to make a documentary short film about SC Bastia’s upcoming game against PSV Eindhoven. The documentary focused on a small town as they, despite harsh weather, prepare for the game. Despite the wealth of footage Tati had captured, he unfortunately had to shelve the film. It took until 2000 before the film was officially completed by Sophie Tatischeff. In the remaining years of his life, Tati had an idea for a film, entitled Confusion, which was to once again feature Monsieur Hulot. The film, which was supposed to be a collaboration with the cult American duo Sparks, was going to be a commentary on the world’s consumption of mass-media. Though the script was finished, the project never came together. Tati also had another film, The Illusionist, that he had intended to be his follow up to Mon Oncle. The Illusionist told the story of a magician who takes in a young girl as he copes with the generational shift that is happening in entertainment. The sad passing of Jacques Tati in November 4, 1982, he suffered a pulmonary embolism at age of 75, originally but an end to The Illusionist seeing the light of day. However, Tati’s daughter Sophie passed the project onto French filmmaker Sylvain Chomet who re-wrote the script and released it in 2010 as an animated film. 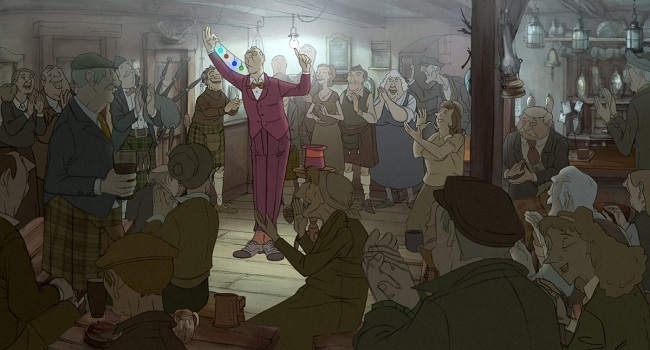 While the premise remained the same, Chomet infused many subtle nods to the genius of Jacques Tati’s films. 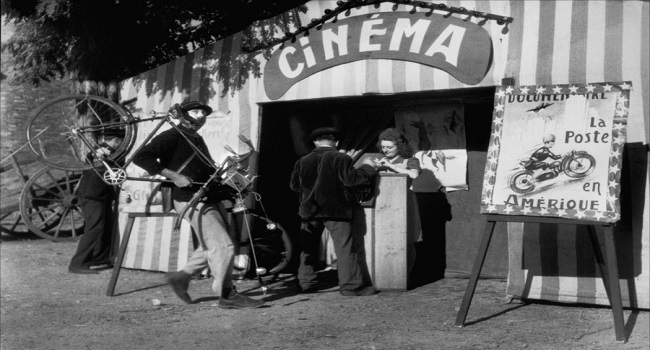 The Illusionist not only received critical and commercial acclaim, but also introduced a whole new generation to the works of Jacques Tati. More than 30 years since his passing, Jacques Tati’s legacy can still be found in both comedy and cinema today. From the silly yet loveable Mr. Bean character, created by Rowan Atkinson, to Steven Spielberg’s whimsical comedy The Terminal, Tati’s influence is unavoidable. Tati managed to create a body of work that still resonates with audiences of all ages. He expertly used humor to offer biting commentary about a world that was moving faster then most people were ready for. Absolutely brilliant post. Sooo excited to see Tati spotlighted and I has a blast reading it. I am a huge admirer of Tati and I find it a shame that more people don’t recognize his work. Thank you. I hope more people see his work. Same here. Appreciate you writing about him. He is unquestionably one of the most creative and involved filmmakers. I’m just glad you’re a fan of his work. Such a great post. I tried to say so on your other site, but my comments always get eaten there. Love this. Love the jump to colour! It’s not often enough we look at a body of work as a whole and really appreciate the innovations found there. Thanks for commenting. I had a blast watching the Tati shorts in recent months as well as his last 2 films. The man is a genius. I could tell that you did! Thank you for such an informative article! I have been meaning to check out some of Tati for a long time… now I have the perfect guide 😀 Cheers! You’re welcome. I hope you get that box set. After all the good things I have read about Tati, a boxset would be heaven! If you have some money saved up. You can get the box set at Barnes & Noble half-price or check through the Criterion Collection website.